The term Grounding or Earthing refers to the connecting of a conductor to earth. The neutral points of generator and transformer are deliberately connected to the earth. In 3 phase a.c. systems the earthing is provided at each voltage level. If a neutral point is not available, a special Earthing Transformer is installed to obtain the neutral point for the purpose of earthing. Neutral points of star connected potential transformers and current transformers are earthed. The neutral earthing has several advantages. The neutral earthing has several advantages. Freedom from persistent arcing grounds. The capacitance between the line and earth gets charged from supply voltage. During the flash-over the capacitance get discharged to the earth. The supply voltage charges it again. Such alternate charging and discharging produces repeated arcs called Arcing Grounds. 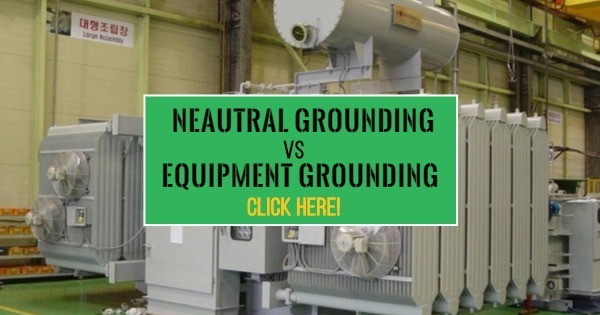 The neutral grounding eliminates the problem of ‘arcing grounds’. The neutral grounding stabilizes the neutral point. The voltages of healthy phases with respect to neutral are stabilized by neutral earthing. The neutral earthing is useful in discharging over-voltages due to lightning to the earth. Simplified design of earth fault protection. The grounded systems require relatively lower insulation levels as compared with u. grounded systems. The modern power systems are 3 phase a.c systems with grounded neutrals. The Equipment Grounding refers to the grounding of non-current carrying metal parts earth. It is used for safety of personnel. If a metal part is grounded, its voltage with respect earth does not rise to a dangerously high value and the danger of a severe shock to personnel avoided.